Some things are just too wonderfully awesome not to share, and this turtle is one of them. I made it as a birthday present for a friend back in September, and managed to get a couple of photos before wrapping it up. After the unexplainable decision of choosing the gift of a handmade turtle (that sounds even stranger written down!) I had a look to see what pattern I could use. 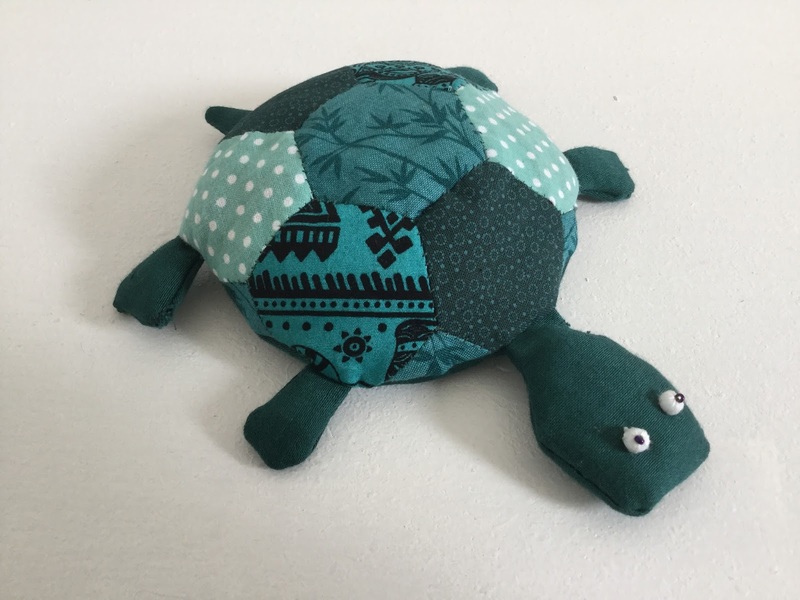 It turns out that a lot of people before me have had the idea of sewing a turtle! 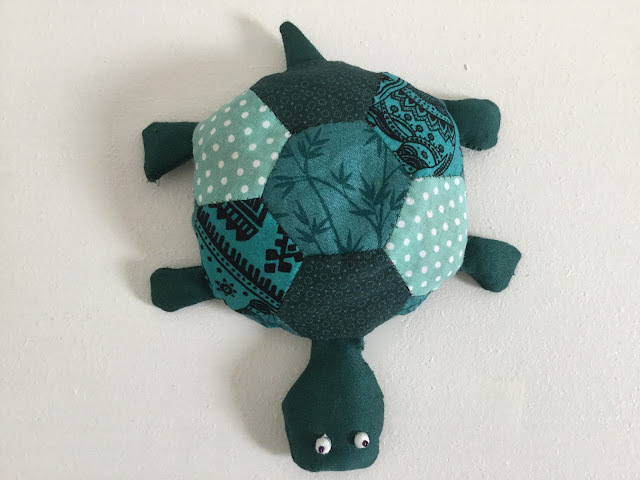 I saw a few options, one of which was this amazing retractable turtle, but I wanted to use a free pattern and one which was quite small. In the end I decided to this pattern from the Hobbycraft blog, which has very clear instructions and is quite irresistible! I would highly recommend using it. Although it doesn't mention that it is English Paper Pieced, the shell is sewn together by EPP, something that I was happy to do. I've mentioned previously that I love EPP, and this was really very quick to sew, don't be put off by the hand sewing as it really doesn't take that long. I decided to use greens and teals to make my turtle, although I actually really like the pink turtle on the tutorial too. I used four different fabrics for the shell and then a solid dark green for the base, legs, tail and head. I like that the shell is symmetrical, meaning that I could repeat the fabrics equally. I decided to de-scale the pattern when I printed it, and I wanted my turtle to be quite small. I can't quite remember the percentage that I changed it too, but it was around 50-60% and this turtle ended up about 5"in diameter, I hope that helps if you are planning on changing the sizing. The only problem with this was that the legs and tail were extremely fiddly to turn the right way after sewing, and there is very minimal wadding inside - which brings me onto the subject of stuffing. I filled the shell with lentils to weigh it down and for the legs, head and tail used stuffing. I think this worked quite well, it means that the turtle will lay nice and flatly on a surface. To finish off, I put a small black bead into a bigger white bead and sewed this on for the eyes, which I think is the perfect final touch. I loved making this and although it was hard to part with, I hope I made it's new owner smile! This is so cute! Great idea to use lentils in the shell part of the turtle. It's adorable. I can see why it was hard to part with but the good news is that you can always make another one! This turtle is so cute. A really lovely gift, handmade with love!